Wolves have given a free transfer to former captain Gary Breen and made five more players available for offers. Jay Bothroyd, Rob Edwards, Darren Potter, Darren Ward and Stephen Elliott have all been put up for sale. Wolves boss Mick McCarthy said: "We want to freshen things up so we need to generate places for new players by listing some of the existing squad." Keith Lowe and Kevin O'Connor have also been released, on top of Thursday's transfer listing of Freddy Eastwood. Assuming they find new clubs, it will mean an exit after less than 12 months at Molineux for three of last summer's signings, Ward, Elliott and Eastwood. And the decision to release injury-plagued 34-year-old Breen, McCarthy's first signing for Wolves in July 2006, closes their 12-year working relationship. 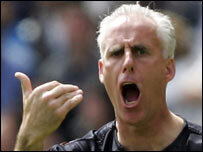 McCarthy has been his manager at club and international level for Sunderland, Wolves and the Republic of Ireland. "I've had 12 great years working with him, " said McCarthy. "But we both knew it would come to an end at some stage. "He keeps himself really fit and has been a fine example to the younger lads. He's been a terrific pro and I'm sure he will go on and be a great asset for someone." Kevin Kyle, Darron Gibson and Graham Stack have returned to their parent clubs - Coventry City, Manchester United and Reading - following the completion of their loan deals.